More than two years ago, in February, Esteban Chaves crashed hard in the Trofeo Laigueglia and sustained a number of injuries, one of the most important being a lesion in his brachial plexus which affected the movement in his right arm, were two nerves needed to be repaired. The surgery performed in his home country went well, but even so, he could recover only 80% of movement to the affected limb. Forced to stay more than three months out of the races, the 2011 Tour de l’Avenir champion began a long way to coming back in the sport and fulfilling his huge potential. At the end of that season, he left Colombia-Coldeportes and signed with Orica-GreenEdge, where he slowly started to show glimpses of his talent in the form of two beautiful victories, in mountain stages of the Tour of California and the Tour de Suisse. But people were expecting more from him, as the pocket-climber had enough material to be a Grand Tour protagonist. After making his debut in a three-week stage race in 2014, at the Vuelta a España, and completing the 2015 Giro d’Italia (where he got to wear the white jersey), he returned to the Spanish Grand Tour with a point to prove and a name to make for himself. It didn’t take Esteban Chaves long to lay his mark, as stage two finishing in Caminito del Rey saw him trade blows with fellow attackers, before taking the biggest win of his career so far and pulling the red jersey on his shoulders. It was an ecstatic feeling for the South American, who kept the lead for a couple of days, until he lost it on the stage to Malaga, won by his teammate Caleb Ewan. Then, just 24 hours later, on Sierra de Cazorla, Chaves showed panache and strength, as he found the perfect timing to attack with three kilometers to go and nail another win, relinquishing the red jersey he lost one day earlier. A brilliant and spectacular rider, Esteban Chaves is on the top of his game and sees his star shining brightly in what is his best race to date. After these victories and almost a week in the red jersey, results which confirmed his potential, he now needs to find out the answer to another important question: is he a rider made for a Grand Tour, a rider who can fight for the general classification? The answer will come in the next two weeks. Cycling is an important part of his family since forever, so it wasn’t a surprise that Davide Martinelli decided to come into the sport very early, as a 7-year-old. It was love at first sight, and as a result, he decided to pursue a career in cycling. Step by step, Davide developed and improved, all this while making the natural transition towards a pro contract. One by one, he rode for G.S. Ronco (during his Junior years), Hoppla, Mg K Vis, before getting a contract with one of the best developments teams out there, Colpack, managed by Antonio Bevilacqua. Riding in his home country, as well as in many foreign races, the young Italian made the most out of it, establishing himself as one of the best time trial riders of the U23 ranks, with three consecutive national titles and a silver medal at the 2014 European Championships. But don’t make a mistake and think Davide Martinelli is just a powerful rouleur: the 23-year-old proved his versatility and consistency more than once, especially thanks to his powerful sprint from a reduced group, that has helped him win the points jersey at the 2014 Tour de l’Avenir and notch a bronze at this year’s European Championships, in the road race. The results he scored in the past season and his impressive skills brought him into the attention of many pro teams, and in the end, Etixx-Quick Step came up with an offer for Team Colpack’s rider, who signed a two-year contract. Here, he hopes to develop and turn himself into a rider capable of winning three of cycling’s Monuments – Milan-Sanremo, Tour of Flanders and Paris-Roubaix – which are his dreams for some time now. This transfer, as well as his results, were two of the topics I discussed with Davide Martinelli last week, when I interviewed him. – Davide, what were your targets at the start of the season? My primary goal was to develop and to improve on the climbs. For this reason, I worked a lot in the gym, in order to be more powerful on the uphills. In the same time, I wanted to search for a pro team that was willing to believe in me and put a pro contract on the table. – What meant for you to win a third consecutive national title in the ITT? The individual time trial is a discipline that really fascinates me and which could help me a lot in the pro ranks, as many short stage races end up being decided for just a couple of seconds. It was very important for me to take another win at the Nationals Championships, because it’s always difficult to repeat the victory you got the year before. – How were the European Championships? I prepared myself very well for this event, although I knew that the parcours doesn’t suit me very much. Still, I was convinced I can get a nice result there, the way I rode the time trial being proof in this regard. To be quite frankly, in the road race I didn’t expect to finish on the podium, because I was there to help the team and our sprinter, but after he crashed I came to the forefront and thanks to my sprinting skills I finished on the podium. I can say that I was half-surprised to get a medal in Tartu. – During your U23 season, you won many races in a bunch sprint. Do you believe you could turn from a ITT rider into a sprinter? I really don’t know what to say about that. On the other hand, I’m aware of the fact that there are many cyclists who are superior to me in a sprint and have a much better kick, but I also know that I’m capable of a long and powerful sprint, which was useful to me in many occasions. – A couple of weeks ago, Etixx-Quick Step revelead you signed a contract with the team for the next two years. What’s the story of your transfer? I have a great relation with Davide Bramati and Joxean Matxin, and in the spring I went to the Bakala Academy to undergo some tests. They were very pleased by my results and we kept in touch. Then, they followed me in other races, like the U23 Paris-Roubaix, and we eventually reached an agreement in the first days of August. I’m really happy for this move and can’t wait for the 2016 season to start, especially as the team is ideal for my characteristics. – Last year you won the points jersey at the Tour de l’Avenir, but this year you’re not in the race. Why is that? A couple of weeks before the start I talked with coach Marino Amadori and we both agreed to take a different approach for the World Championships than the one I had in the past. It was a decision we both fully agreed on, although I must say I would have liked to line-up for the Tour de l’Avenir. – So in what other race will you go until the end of the season? The plan is to ride two or three races together with Colpack, where I want to help my teammates, and also be at the start of the Chrono Champenois, in France. My desire is to use these races in order to build my condition for the World Championships in Richmond, where I’ll take any opportunity if one were to arise. At first glance, it could seem strange that my pick comes from a 2.HC race United States race, giving that last week-end saw the 20th edition of the Vattenfall Cyclassics take place, as well as the first two stages of the Vuelta a España (the season’s third Grand Tour), but the truth is that Rohan Dennis’ masterful display in the USA Pro Cycling Challenge couldn’t go unnoticed, because it was one of the most impressive seen this year in a stage race, albeit one should mention that only four World Tour teams came at the start of the Colorado event. Interesting enough, BMC’s plan before the race was for Rohan Dennis to be Brent Bookwalter’s domestique and guide the US cyclist to a GC win. During the first stages, the 25-year-old Aussie did a good job for his teammate, pulling all the time at the front and protecting Bookwalter, before becoming the team leader’s after a great attack on stage four’s Moonstone climb, that put him in the yellow jersey, which he kept until the end, in Denver. Even more outstanding than his two stage victories – both which came in Breckenridge – was to see his versatility on the flat, mountains and in the ITT, a sign of improvement and sheer power. Two years after showing glimpses of his great potential at the Criterium du Dauphiné, where he wore the yellow jersey before finishing 8th in the overall standings, the rider from Down Under found the consistency that has elevated him in the eyes of his team and repayed the trust put in him last August, when BMC decided to transfer him from Garmin-Sharp. On short term, Rohan Dennis will look to the World Championships in Richmond, where he has a fair shot at the gold medal in the individual time trial race. Then, in the future, there should be no surprise if he’ll line-up in the Tour de France as one of the big contenders for the overall victory. Although he didn’t land a win so far, Rodolfo Torres was one of the most consistent cyclists of the year. Kicking off his second pro season in the second half of January, at the 9th edition of the Tour de San Luis, Team Colombia-Coldeportes’ rider put on an impressive display on the climbs, winning the mountain classification and ending second in the overall standings, ahead of the 2014 Giro d’Italia champion, Nairo Quintana. That was a sign of the things that were to come later in the season, with the 28-year-old Colombian being one of the most aggressive riders in the pack every time the road began to rise, regardless of the race. Thanks to his attacking mode and the constant improvements he’s made, Rodolfo Torres nabbed some more results in important stage races, such as the Giro del Trentino and the Vuelta a Burgos, where he came in the standings ahead of many World Tour cyclists, thus showing his class. Precisely for these reasons, Rodolfo Torres will be one of the riders to watch out for in the Vuelta a España, which began Saturday, with a team time trial in Andalucia. As was the case in the past, also this year the race has many uphill finishes and more than 40 categorized ascents; for a natural born climber like Torres, this is a great chance to score a big result, so expect to see him lighting up the race every time he has the opportunity. – Rodolfo, you were one of the season’s pleasant surprises, finishing five stage races in the top 10. Yes, it has been a strong year for me so far. This comes as a result of the good preparation I’ve had during the winter, when I worked hard in order to reach a good level right away. I felt things went as I wanted, as racing in Europe with a strong pace helped me raise my bar. – Of all your results, which is the one that makes you the most proud? Being on the podium in the Tour de San Luis. It was a good race with some strong opponents, including several World Tour riders. Ultimately, it was great to share the podium with Nairo Quintana. – Do you have any regret? I would not say there’s a regret I have, as we have tried to put in everything we had time after time. On the other hand, of course we had some unexpected accidents, like the one in Vuelta a Castilla y Leon, or losing a stage by just a few metres in the Tour de Luxembourg. – Recently, you raced in the Vuelta a Burgos. How was it? I had pretty good feelings, and in the end I was quite satisfied with our performance in Burgos, both personally and as a team. – Next up for you is the Vuelta a España, your second Grand Tour, after the 2014 Giro d’Italia. I am very excited about it and prepared to tackle this race with a different mentality than at the beginning of last year’s Giro. I must say that the Corsa Rosa was a great experience and really helped me to grow as a rider, and now I’m very motivated for the Vuelta. – What do you think of the course? It is a hard route, with plenty of mountains, but I think that this makes it good for us, the riders of Colombia-Coldeportes. Besides the climbs, I also expect the crosswinds to take their toll through the race. – And what goals will you have? To be combative day after day, to give my best, and possibly go for a stage victory. If it’s possible, I will try to win the best climber jersey, as it means a lot for Colombians, and also for our team. Anyway, it remains to be seen what the plan will be and what task each rider will have. Among the riders making their debut in the 70th edition of the Vuelta a España – the season’s third and final Grand Tour – there will be also Joe Dombrowski, who comes here after taking a breakthrough win at the Tour of Utah, where he put years of suffering behind and enjoyed his finest moment since turning pro. The 24-year-old will be one of the many Cannondale-Garmin cyclists hoping to shine and thus get a stage win, and although this is going to be his maiden three-week race and he starts as an outsider, Dombrowski shouldn’t be overlooked, as he can turn into one of the Vuelta’s revelations. A couple of years ago, he was seen as the next big thing in cycling, after winning the prestigious Girobio and finishing in the top five at both the Tour of California (where he also was the best young rider) and the USA Pro Cycling Challenge, two events in which he outshined many pros. His impressive results led to a contract with Sky, but the two-year spell with the British outfit wasn’t a happy, but more a bleak one, due to many health problems which kept hampering him, problems whose main cause remained unknown for a long period of time, until a vascular specialist told him to undergo some tests, before finally discovering what was really troubling him: iliac endofibrosis – basically, a drop of blood flow in his iliac artery, which meant he was getting 50% less blood in his left leg than normal. After having surgery at home, he took a long break before coming back on the bike and starting to work in order to gradually build his form. Eventually, at the end of the season, Joe changed teams, moving to Cannondale-Garmin, where he was looking forward to show that he can come back to the top. Making his debut for the US team in Argentina, at the Tour de San Luis, Joe Dombrowski finished in the top 10, which made him very confident ahead of his next goals, the Tour of California and the National Championships, two races in which he put on an impressive display, finishing fourth and second, respectively. For that reason, and taking into account that his form was constantly on the rise, his stage win on Snowbird and overall classification victory in the Tour of Utah didn’t count as a surprise, but more as a confirmation of the fact he finally reached the much desired top level just weeks before the start of the Vuelta, where he comes very motivated to test himself and see what he can do in a three-week race. A couple of days ago, while he was still at his home in Nice, I talked to Joe Dombrowski about the way his season went since pulling on the green and argyle of Cannondale-Garmin and the expectations he has ahead of his Grand Tour debut. – Joe, what were your thoughts at the beginning of the season, after joining Cannondale-Garmin? I was a good change for me and I’ve really enjoyed it so far. I feel really at home being in a US team and I think it’s a good environment for me, I feel comfortable and I like being among other Americans. Another important thing is that at Cannondale-Garmin I have more opportunities than I did with Sky. I want to develop into a GC rider, so I think that Cannondale-Garmin, at the moment, is the right option for me to do that, because I can go on some of the races and ride in support of Daniel Martin, Andrew Talansky and Ryder Hesjedal, while in some smaller races where they aren’t there I can be the leader of the team. It’s very important to have more opportunities for myself, than I did in the past. – Looking behind at your two years with Sky, what conclusions can you draw? It was a little bit difficult, because last year I had the injury and the operation on my iliac artery, and it was hurting my performance. Once the operation was done, it was almost three months before I was out training on the road again. So last season I didn’t raced so much. But no matter on what team you’re in, to have an injury like that means it’s not going to be a nice experience. Other than that, I learned a lot during my two years with Sky and got exposure by riding the big races, and I also got to live in Nice, where is my European home and where I feel comfortable. Maybe I didn’t score a lot of results and I was having a lot of setbacks because of the injury, but I wouldn’t say it was a negative experience. – After these troubled seasons, how important was it for you to get a top 10 in your first race of the year, the Tour de San Luis? I think it was good. It’s an early season race, and as a North American rider coming from the cold, and racing in the summer against South American cyclists who are in good shape, meant the race was a tough one. I wanted to see how I can go, because it was my first real test after having the operation and coming back after the injury. It was a good start for me and it gave me a lot of confidence, I felt I’m back in the game and I also had fun, which is very important for me. Cycling is a hard sport, it’s about suffering, but if you’re in an environment where you’re having fun, you really look forward to the racing. – Not many riders say they’re having fun in the races. For me this is what I’ve dreamed of doing and I don’t want to take for granted the fact that I’m basically getting to do what I dreamed of doing for a living. I don’t think there are many people – doing all kind of jobs – who can say that they are living their dream when at work. For me, that’s the case: I love riding my bike, I love racing, and I love everything about it – the training and focusing on being fit for the races, traveling all over the world and living in a foreign country. There are a lot of things that I’ve been really lucky to do. Of course, sometimes you get some crappy weather and you don’t have a great morale and don’t feel like getting out there and racing, but overall I love what I’m doing. – After San Luis, you had a good run on home turf, in both the Tour of California and the National Championships. Did you see the glass half-full, or did they leave you with a bitter taste? Concerning the Nationals, I’ve always thought about how cool it would be to wear the national champion jersey for a year. It’s just something really special to do that at some point in my career. Second was a good result for me in a race like that, giving that everybody went there wanting to win. It wasn’t a race for me initially, but for my teammates, as I really can’t sprint very well. Still, considering the way it played out, I got an opportunity in the end. I was a little bit disappointed to be runner-up, because I wanted to win and wear the jersey for a whole year. In the Tour of California, my ambition was to be on the podium, but I finished fourth, which I can say it still was a good result. Overall, I can be happy with that, considering that the year before I was in just a couple of races. Basically, California confirmed to me that I was on the way back. – Did you felt like you kept improving between the Nationals and the Tour of Utah? As you know, I came back to Europe, the plan being to ride for the general classification in the Tour de Suisse. I don’t know if it was because of the fact that I was tired as I began my season early, in San Luis, but I wasn’t very good in Suisse. So after that, I returned home to the US and didn’t touch my bike at all for some time. Basically, I took a vacation, went to see some friends and pressed the reset button, as I knew I’ll do the Vuelta at the end of the year. I wanted to make sure that I’ll come into the second half of the season really fresh. I haven’t trained so hard before the Tour of Utah, but I still prepared for the race, because I wanted to have a good GC. In the end, I kind of surprised myself in the Tour of Utah. – But what were your thoughts before the start? Obviously with the news in regard to Tom Danielson it was a shock, it’s not really what someone wants to hear at the start of the race, it’s a bit difficult, but I talked with the guys the night before the race after we heard what it happened and I said that we still have a race to do and that I think we can still win it, as well as takins some stages along the way. So we decided to think about the race, to focus on it and make the best out of it. We all did a great work and overcame a difficult situation. – How much did it mean for you to win the race? It was great. That’s my first ever victory as a professional, and winning the stage to Snowbird was special, as well as taking the yellow jersey and defending it the next day. It was awesome. This season was kind of a reset year and to have my first pro win was very nice and special. 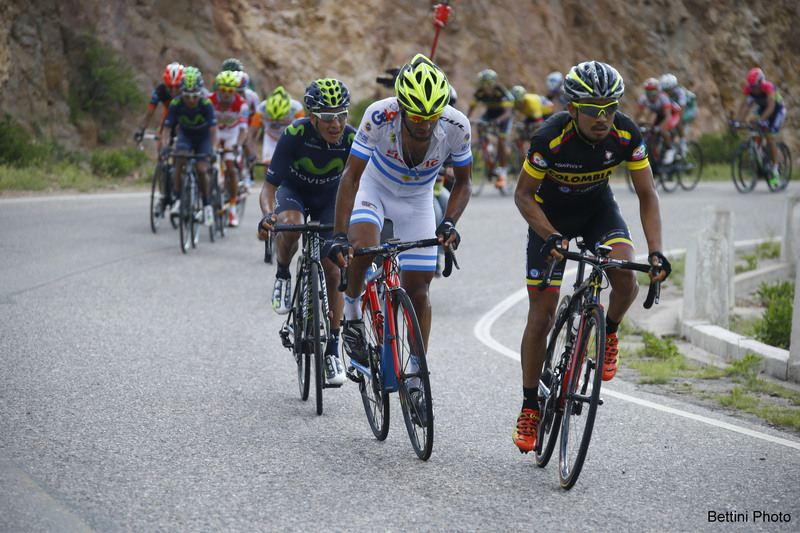 – The Vuelta a España is up now on your schedule. Are you nervous about making your Grand Tour debut? I’m pretty relaxed, actually. I know I haven’t raced in a three-week event, but I’m excited about it and I’m really looking forward to gaining experience. I still don’t know what my role is going to be, but I’m sure that it’s going to be a good experience. I’m in my third year as a professional and it’s very important to finally get to ride a Grand Tour. It would be a really big step to finish such a race. – Besides this, what other goals do you have? Well, I’ll have to see are the plans of the team, but especially in the third week – once the general classification is established and there are bigger time gaps – I could go in a breakaway on a mountain stage. If there’s no one dangerous there, there’s a good chance they’ll let it go, and once you’re there you don’t fight against Froome or Quintana, but against the other guys who are in the escape. If I’d get the opportunity to fight for a stage victory, then I would love to get one. The Vuelta is always mountainous and has short and punchy climbs at the finish, which will be the case also this year. Then there’s the Andorra stage, with six major climbs. It’s going to be one of the hardest routes of the year, and looking at the startlist, it’s maybe the Grand Tour with the most depth in terms of Grand Tour stars: Froome, Nibali, Quintana, and the list goes on, it looks like everyone’s doing it. It’s going to be a very high level here. – Did you pick your books for the Vuelta? Yes, I did. I got a lot of suggestions on Twitter and I now have plenty of books to read during the three weeks of the race, one of the books being Richard Moore’s „The Bolt Supremacy”. Personally, I think that it’s very important to read a book in the evening, especially in a Grand Tour and any stage race, actually. You ride hard during the day and you need a nice way to relax. In my opinion, you have to put down your phone, your electronics, your computer, and just read a book before going to bed. It’s really great to go old school and read some books, and it’s something I like to do during the race. We need less smartphones, and more books. In the past couple of years, it became a habit to have a young Colombian rider making a name for himself in a tough race, despite lacking experience at pro level and riding against more powerful opponents. In 2015, the one coming into the spotlight was Daniel Martinez, the 19-year-old cyclist of Team Colombia-Coldeportes, who got his season started in February, at the Gran Premio Costa degli Etruschi, and needed only four months to draw attention upon him, at the Route du Sud, where he won the mountains classification. Less than two months after completing the French event, he went to the Tour of Utah, where he turned into the revelation of the race, impressing everyone not only with his skills, but also thanks to the maturity displayed, well beyond his young age. In Utah – arguably the toughest cycling race in the US – he went head-to-head with the overall contenders on the Snowbird and Park City stages and finished 8th in the general standings, as well as taking home the best young rider jersey. At the end of this week, Daniel Martinez will line-up for the 52nd edition of the Tour de l’Avenir, a race with which Colombian began an intense love affair since 1980, when Alfonso Florez nabbed a memorable victory against more well-known European riders. But before going to France, he took on the invitation of Cafe Roubaix and opened up about his first years in cycling and the results he got so far as a pro. – Daniel, how did you began cycling? It was through my brother, who liked cycling and started riding. Inspired by him, I began cycling at age 14, riding for the Club Ciclo Soacha. I remember everything from that time, from my first races, which were circuits and one-day races within the region, to watching the Grand Tours and wishing to get there in the future. – How important was for you to win the Vuelta del Futuro in 2012? It meant a lot: it was one of the most important races for my category, and I really wanted to win it. Moreover, I knew that a success would have opened many doors for me. – Then, one year later, you took the gold medal in the Junior time trial race at the Panamerican Championships. Were you surprised by that victory? No, I can’t say it came as a surprise, because I had worked a lot for that goal, and I had long been focused to go and win it. – How did you end up in Europe? The turning point was the World Championship in Florence, where I got in the breakaway: it actually opened the doors to Europe for me, as the next year the UCI invited me to the World Center. – In 2014, you got to race in France, Switzerland and Spain, including the World Championships in Ponferrada. How would you rate this experience? All these were amazing experiences, because there I had the opportunity to learn a huge lot on racing in Europe, and certain habitudes and routines that are part of it, and need to be apprehended. I also got to see that the races from Europe are longer and more organized, while the ones in South America are more “instinctual”. – And all these races helped you turn pro. I have to say that this was a very important step in my career. It was the goal that pushed me to start riding a bike in the first place. – Recently, you finished 8th in the Tour of Utah. How was it? It was by far the best race I have had as a profesional so far. I must admit that I was a little bit surprised to get such an important result. The feelings were good, but there were very strong opponents there. – What improvements have you made this season? The progress has been pretty significant. At the beginning, it was very hard to me to have good feelings deep into races, that is when the decisive moves happen. Now things are going pretty much better, and I feel more confidence and experience. – Next up is the Tour de l’Avenir. What are your goals? I am leaving for the race with many expectations, just like my other teammates, to go and put on a strong performance, trying to bring the overall title to Colombia once again.